For four days in December, Sedona locals and visitors were treated to a spectacular light show - the inaugural Sedona Northern Lights. Projected onto Camelhead Rock, this special illumination became the country's largest 3D mapping project displayed on nature's canvas.This ambitious undertaking was created by LA-based PaintScaping and involved state-of-the-art Barco projectors located over half a mile away. 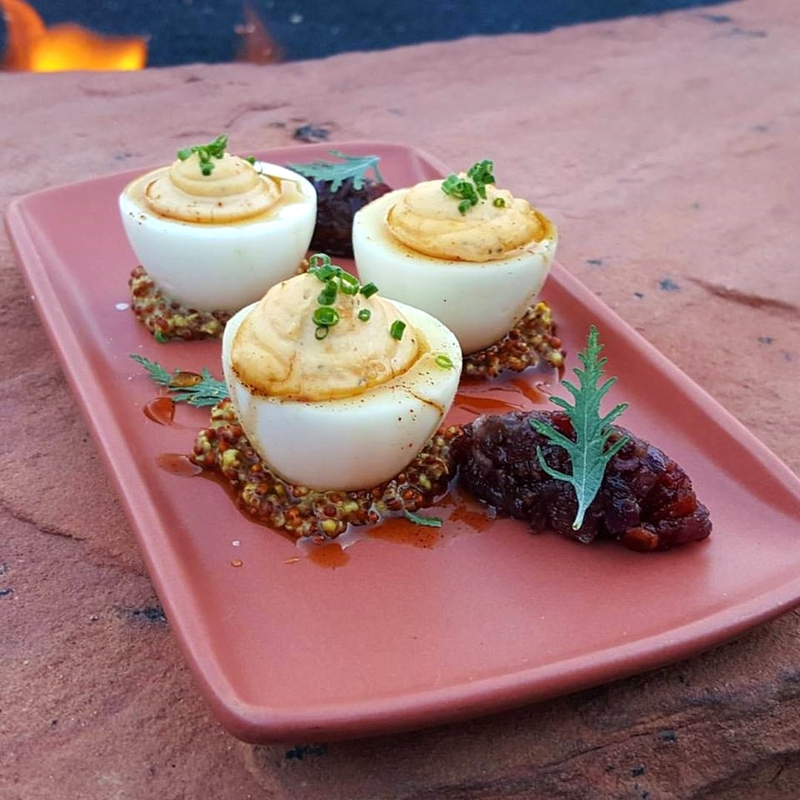 The show could be seen from a variety of viewing locations, but the best setting to experience it was one of my favorite Sedona destinations, the Amara Resort and Spa, a Kimpton property. We were invited for the kick-off festivities on December 14 at a VIP launch party as guests of the resort. We checked into our beautiful room (you can see more photos and details of a past visit here) with its picturesque vistas of Camelhead Rock, and welcomed with "movie" snacks for the evening's event. Sedona Northern Lights took place on December 14 through December 17 at 6 pm, 7 pm, 8 pm and 9 pm at the top of every hour. Camelhead Rock is the striking rock formation seen prominently in the photo below, and Amara's signature restaurant, Salt Rock Kitchen, and its scenic patio was a prime location for "dinner and a show." 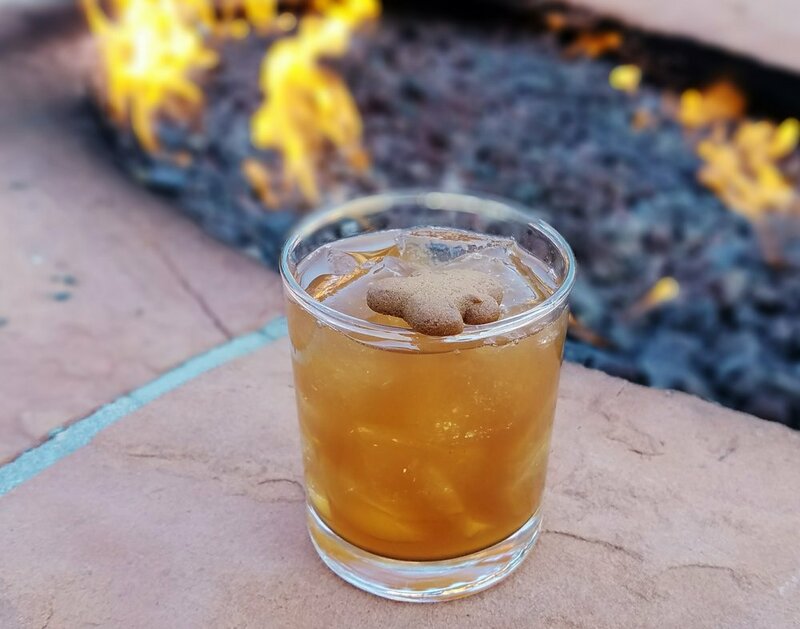 After checking in, I immediately headed to the bar at Saltrock to say hello to my favorite Sedona cocktail craftsman, Ardi Dulaku. I'm a big fan of savory notes in my libations, so when Ardi explained the work that goes into his sweet potato and fig puree for the Bourbon Farm, I knew what to order (made with Bulleit bourbon, sweet potato-fig reduction, fresh lemon juice, walnut bitters and egg white). Ardi also gave me a sneak preview of two cocktails he was debuting that night at the VIP party created specifically for the weekend's light show, including his Naughty Turtle with pecan-infused bourbon, gingerbread-spiced caramel reduction, chocolate bitters and a gingerbread man cookie garnish. Starting our night with the first show meant that we would be able to see it throughout the evening as we joined our friends Jan and Anthony on the Saltrock Kitchen patio. A Northern Lights holiday $55 four-course prix-fixe included a complimentary bubbly toast and mouthwatering choices such as deviled eggs with pasilla-maple syrup and bacon-onion marmalade, osso buco with chorizo-white bean cassoulet, and achiote-spiced shrimp with lemon grits and smoked poblano-tomatillo salsa. Each table received crunchy jicama sticks and citrus dipping sauce as a complimentary amuse, and we also shared the creamy aerated beer cheese with fresno chile oil and tortilla chips. and fried softshell crab with huitlacoche puree, jalapeno drizzle, and mustard vinaigrette. I skipped dessert to order Ardi's second featured cocktail, the Desert Snow (with vanilla-infused reposada tequila, eggnog, spiced froth and nutmeg), before we moved on to s'mores around the fire. 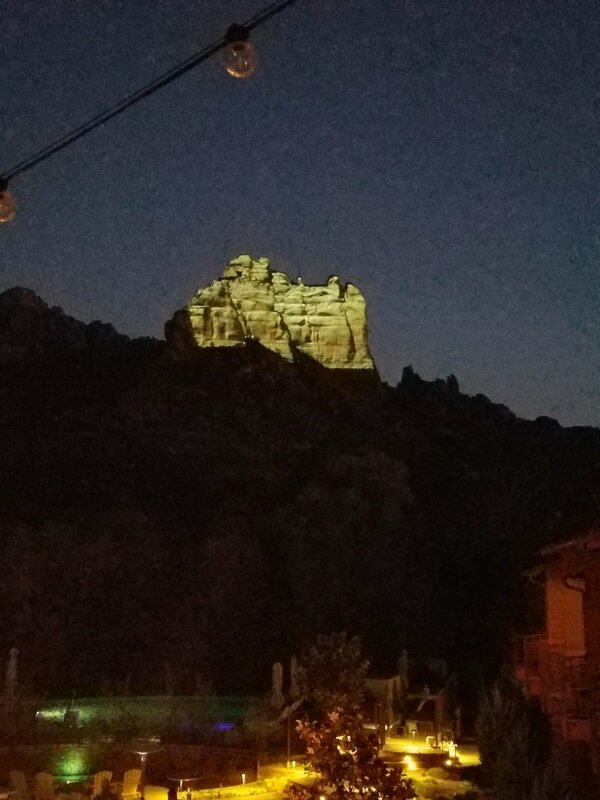 Throughout the evening we soaked in red rock vistas under the stars and took in the beautiful Northern Sedona Light show. The Courtyard was set up with plenty of heaters and cozy blankets on a clear December night, along with a menu of specialty holiday cocktails, hot chocolate, and warm cider, and sweet treats of s'mores kits, candy, and popcorn for purchase. Bundled in soft blankets around a crackling fire, I ended a magical night with the Fernet About It, combining Plantation rum, Campari, Fernet Branca and cola syrup. Another wonderful stay at Amara Resort and, as always, I can't wait to return. Amara Resort & Spa is located at 100 Amara Ln, Sedona, AZ 86336. To book your stay call (928) 282-4828. I was invited as a media guest and my stay was complimentary. On my interview with Executive Chef Massimo de Francesca of SaltRock Kitchen at Amara Resort (see that feature here), he didn't just talk about the food. "We definitely have the best cocktails in town", he enthused. "They’re really delicious, true hand-crafted cocktails." Needless to say, I couldn't wait to see for myself and, after imbibing, I immediately agreed. 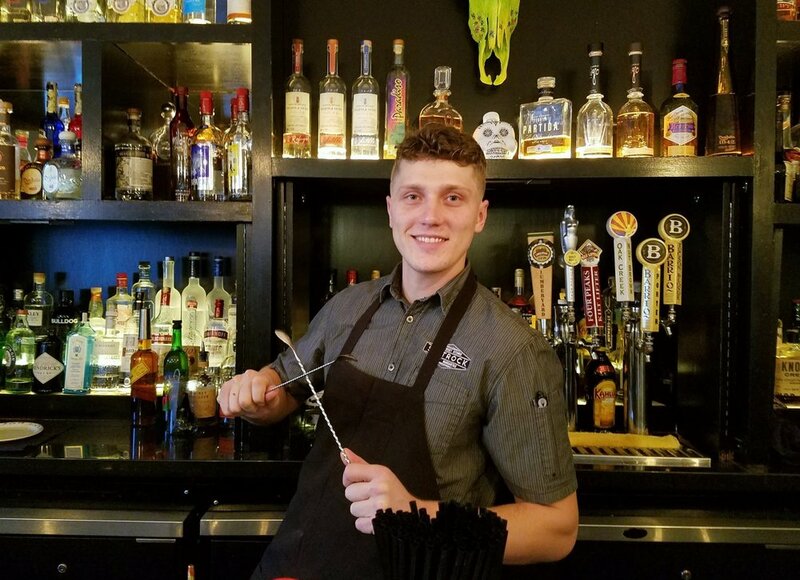 Ardi Dulaku is the young talent behind the bar who has put SaltRock Kitchen on the Sedona cocktail map. I was eager to meet the man behind the creative cocktail menu, and he kindly agreed to an impromptu interview. Ardi Dulaku grew up in Kosovo and remembers was drawn to food and gardening at a young age. "I'm obsessed with working with dirt; I always call it dirt therapy." He recounts stories of guarding watermelon fields, helping himself to a neighbor's pecan trees, and training his palate on the abundance of fresh fruit and vegetables, even developing a taste for the tart bitterness of unripe fruit. He grew up with a love for cooking and this food philosophy translates into his well-balanced cocktails . 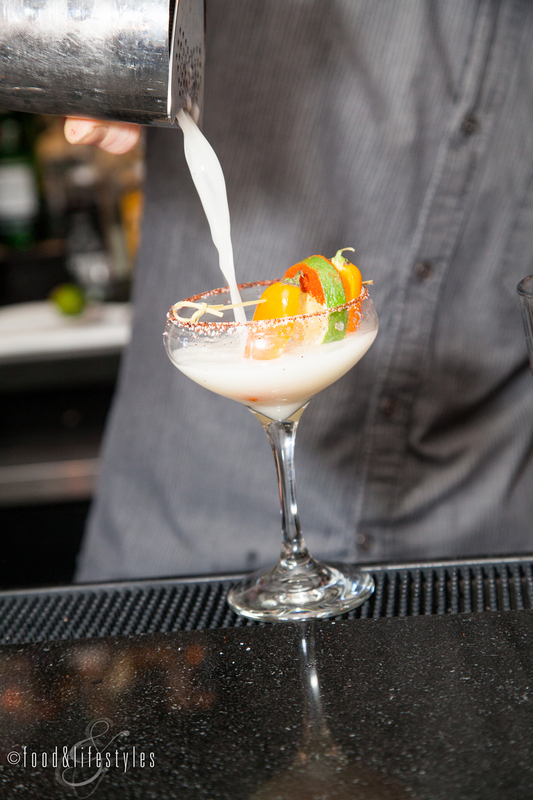 "I try to think about my drinks like I’m a chef, I’m very ingredient-driven," he explains. The menu is designed with a broad appeal. "We have classics, we have tropical things, we try to do a little bit of everything," Ardi explains. "I can put a lot of time into a drink, but it can be hard to convince someone to try something new; it really has to taste good to impress the consumer who is not trying to experiment." Fresh ingredients and housemade elements are paramount. "'No shortcuts is really the secret to a good cocktail." As I sample the inventive libations he decided to feature, he explains that they were chosen "to represent different aspects of what we can do. We can work with mezcal and tequila, we can work with American-style gin, and we can work with whiskey." They were just as wonderful as they were photogenic. First up is his Kokopelli. "This one has mezcal, and Kokopelli is a part of Native American folklore, so it represents the Southwest. I like the Vida mezcal because it holds the smokiness when you add a lot of different things. This drink has a little egg white as well and then a grilled pineapple syrup. The pineapple works really well and smooths out the mezcal. There’s just something about the smokiness with the pineapple that make this uniform flavor when they come together." "It has a spiced chile-salt rim made with red chile, cayenne pepper and paprika. The lime wheel is also dipped in the chile salt and then of course a fresh pepper. It's smoky and spicy." "Someone will ask what the Desert Flower tastes like. And I say it tastes like working in your garden. Really what I mean is when you're digging a root vegetable out of the ground and you’re smelling that dirt. You can smell that vegetable, that beet, that smokiness. I want you to taste and experience a memory." "The gin, thyme, and blackberries go really well together in the Thyme of the Season. The Aviation gin is really good, I really like it. Blackberries aren’t sweet, they’re tart, and at this time of the year, we walk down by Oak Creek and pick and eat blackberries. We’re bringing a little of the creek to tthis drink and the thyme adds an earthiness." "We spice our own cider here and the Red Rock Harvest has Tennessee Whiskey, which works really well. The aromas come out of the whiskey once it’s warmed up. We make our own cinnamon and star anise syrup and then top it off with a little coconut cream, so the sweetness is coming from the coconut. A lot of this inspiration was my older brother. We wanted a hot toddy, but a lot of the time when you get a hot toddy, it’s all the same - just lemon, honey and whiskey. You know when you walk in a store and it smells like Christmas? I wanted that aroma, that warmth, that blanket in a cup." Do you have a favorite spirit? Tequila. I love tequila. What do you like best about working in the industry? It’s always good when you have people show up at the bar and they want to try something new. That’s one of my favorite times because I’m like, all right, I can go for the beet juice. What do you find the most challenging? Creating a drink that can be made fast and efficiently. That's probably one of the hardest challenges. We can all make a good drink if you take an hour. But can you make a really good drink in 3 or 4 minutes? It's finding that medium between efficiency and deliciousness. Do you have a mentor? A lot of things go back to my older brother. He’s really trained me a lot. Starting out, I was more into the ingredient aspect of cocktails. What he taught me was structure and what it means to be a good bartender. One of the first things he taught me about a bar is the importance of cleanliness and everything has to be fresh. Do you have a lot of freedom to create cocktails? A lot of times we do. That is what’s great about Kimpton and Amara. They’ve always been so supportive, letting me come up with a concept and put it on a menu. What are you inspired by? I used to love cooking before I got into drinks, and I get inspired by [Amara Executive Chef] Massimo. I look at one of his dishes and I think what can I do to match that? Just seeing his deviled eggs and how he does them so differently. What would you pair with that dish? Our Spiced Maple Sour, absolutely. It has reposada tequila, the same pasilla-maple syrup used for our eggs, and lemon. Are there any new cocktails you’re working on? We're doing drinks with local kombucha to try to do something different. It's the local honey one. They're made so well, they're very mellow. We're working on getting those to shine in a cocktail without adding too much to it. Click here for a feature on Amara Resort & Spa, a Kimpton Hotel. Click here for An Interview with Chef Massimo de Francesca of SaltRock Kitchen.